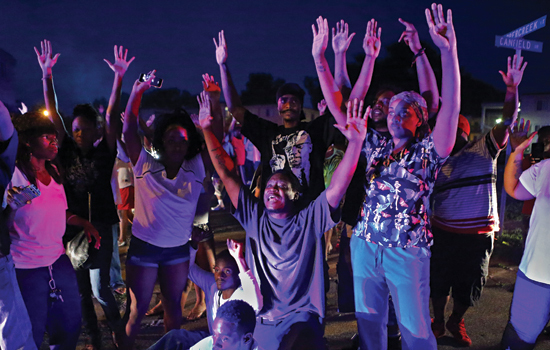 Residents taunt police officers who were arriving to break up an angry crowd in Ferguson, hours after an officer killed Michael Brown. Editor’s note: All photo captions are provided by the <em>St. Louis Post-Dispatch</em>. When David Carson was a high school student in the Boston area, he admired the work of Boston Globe and Pulitzer Prize-winning photographer Stan Grossfeld. That’s why when the aspiring photojournalist looked for colleges, his first choice was RIT. Now Carson ’94 (professional photographic illustration) may be the one inspiring today’s students. In April, he joined Grossfeld ’73 (photography) as one of eight RIT graduates who have won a combined 12 Pulitzer Prizes. 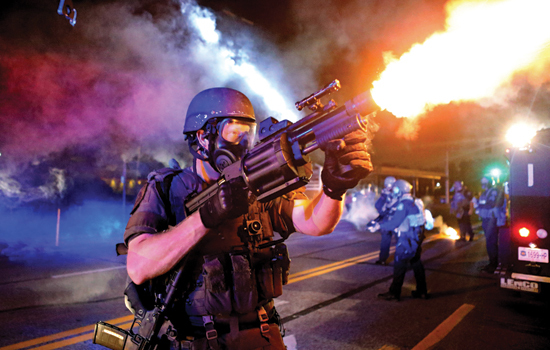 Carson was a member of the photography staff of the St. Louis Post-Dispatch, which won the Pulitzer Prize for Breaking News Photography for the newspaper’s coverage of the events in Ferguson, Mo., following the police shooting of Michael Brown, an unarmed black teenager, by a white police officer. Eight photographers and three editors submitted a gallery of 19 photos from the shooting scene, street protests, funeral and arson fires. Carson contributed seven. “Your celebration is tempered by the fact that someone lost their life at the beginning of these events,” said Carson, who has worked at the Post-Dispatch since 2000. Before that he was a staff photographer for the Naples Daily News in Florida and a contract photographer at the Providence Journal-Bulletin in Rhode Island. Carson said he wasn’t working the day of the shooting or the first night of the riots, but the self-described news junkie was watching the events unfold on Twitter. He asked photographers on the scene if they needed help. “I felt compelled to get out there and help tell this story,” he said. He and the rest of the staff worked long days for two weeks doing just that, getting little sleep and sometimes forgetting to eat. He said there were times that he was scared. 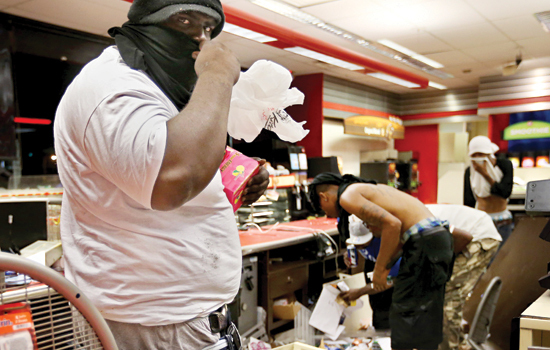 Once was when he was taking pictures of a QuikTrip that had been looted and set on fire. Earlier in his career, Carson had covered the war in both Iraq and Afghanistan and drew upon the hostile environment training he had received. 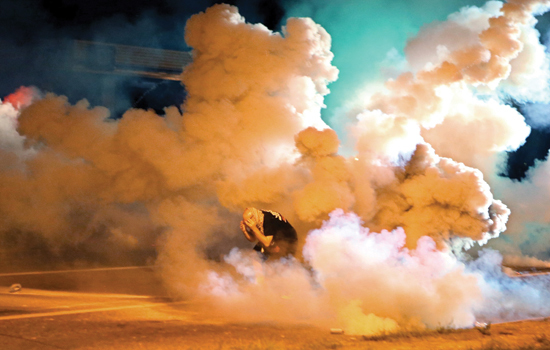 William Snyder ’81, a professor and program chair of the university’s photojournalism program, said Carson made some of the most iconic images from the Ferguson protests under extremely difficult circumstances. Carson consulted with Snyder, a winner of four Pulitzer Prizes, when working on the Pulitzer entry. Along with Snyder and Grossfeld, the other Pulitzer Prize-winning photojournalists from RIT are Paul Benoit ’76, Robert Bukaty ’82, Ken Geiger ’11, Dan Loh ’95 and Anthony Suau ’78.